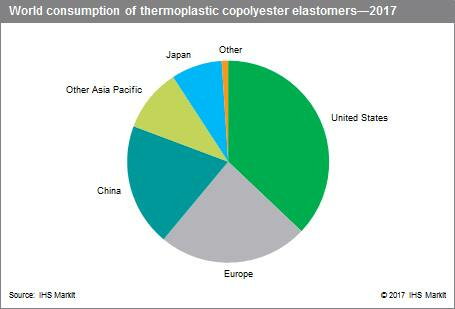 Thermoplastic copolyester elastomers (TPC) are a class of thermoplastic elastomers (TPEs) that combine many of the properties of both thermoplastics and rubbers. TPCs are high-performance engineering materials with thermoplastic behavior and structural strength, but also exhibit elasticity and resistance to impact and flex fatigue. At low strains, they have a low hysteresis and behave like a perfect spring with ideal elasticity. In addition, these materials possess excellent resistance to oils and chemicals and have high service temperatures. TPCs have replaced other materials, such as metal and general rubbers, and will continue to do so, as well as replacing composites of rubber with metal, glass, and fabrics without reinforcement. The largest consuming nations/regions in 2016 and 2017 were the United States, Europe, and China. Together they represent more than 80% of total world consumption. TPCs are used predominantly in automotive parts/components (an estimated 45–46% of total world consumption in 2016 and 2017), hose and tubing (17–18%), medical uses (10–11%), and wire and cable (8–9%). China continues to be the largest TPC importing nation. China has capacity to produce TPC, but operating rates remain at low levels because of the high technical requirements and rather complicated production processes. Exports have been dominated by the Benelux countries and South Korea. In recent years, China has emerged as a major TPC consumer, driven by the growth of its domestic automotive industry. TPC consumption in China tripled from 2007 to 2016, and consumption is expected to continue to show strong growth of 6–7% per year through 2021. The United States, Europe, and Japan are relatively mature markets for TPCs and are expected to grow at moderate rates over the forecast period. World consumption of TPC is expected to grow at about 3–4% per year during 2016–21. In the thermoplastic elastomer markets, as in other plastics/elastomer markets, products partially based on renewable (bio-based/agricultural) feedstocks have been introduced into the market (engineered to reduce the use of fossil fuels). One of the global leaders in biotechnology and/or products from renewable feedstocks is DowDuPont. The company uses 1,3-propanediol (corn-based; Cerenol™) for its Hytrel® RS TPC soft blocks, including 20–60% renewably sourced material from nonfood biomass, and 1,4-butanediol from bio-derived succinic acid in the polybutylene terephthalate (PBT) hard phase. Since 2010, DSM has offered its Arnitel® Eco, with 20–50% content derived from renewable resources. One of the drivers for continued growth in the TPC market is current market pull as a result of anti-PVC pressures (especially in medical uses), overall weight reduction (particularly in the automotive industry), luxury status (use in higher-end markets over lower-cost TPEs or other resins), and sustainability. The strongest demand driver continues to be automobile production.